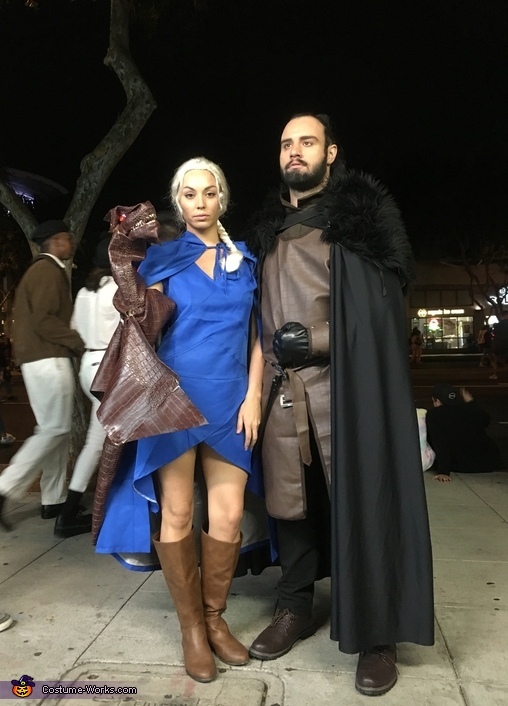 Mike Mastronardi dressed as "The king of the north", Jon Snow. Jadeon Stage dressed as " The mother of dragons, breaker of chains and the unburnt, The Khaleesi ", Denarus Targarian. We purchased both costumes/accessories online and at your local Halloween store. As far as Khaleesis puppet dragon we made by scratch. We used faux alligator vinyl, foam and stuffing for the dragon. We free hand drew the dragon body, head, wings and tale. Hand sew the pieces together (leather needle) and stuffed the dragon. We used sharp sea shell pieces purchased at michaels for the teeth and for the eyes we used decorative marbles and push pins. The decorative marbles also lit up so that was the extra prize.